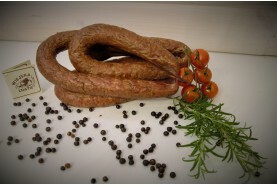 typical country sausage. Large splices of meat especially pork ham. Largely minced. Juniper aroma for this kind of sausage. Extra spices in the form of coriander, marjoram and pepper create the unforgettable taste. - rings of approx. 0.6kg.